A woman's death at the hands of a man suffering with paranoid schizophrenia could have been prevented, according to a Healthcare Inspectorate Wales report. 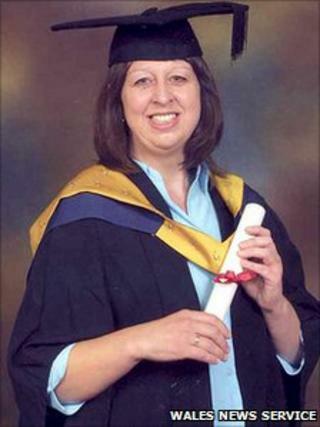 Nurse Karen Welsh, 52, was strangled at her Cardiff home after befriending John Michael Constantine, 33. She had met the fellow hospital patient while being treated for depression and helped him when he was homeless. The report pointed to poor communication between health workers, police and probation officers. Constantine was detained indefinitely under the Mental Health Act in March 2011 after admitting her manslaughter by diminished responsibility. Cardiff and Vale health board is criticised after he was treated on a number of occasions by healthcare professionals but there was poor assessment of the risks he posed to others. Police and probation officers failed on a number of occasions to act on an arrest warrant for Constantine after he breached the conditions of his suspended sentence for assault, burglary and car theft. Constantine strangled Ms Welsh at her home in Thornhill after she offered him a place to stay after she befriended him while both were being treated at Whitchurch Hospital in Cardiff. Named as "Mr J" in the HIW report, the inspectorate said it was clear that "opportunities to engage" with Constantine had been missed. "We are of the opinion had there been a more assertive and less fragmented attempt by Health and Statutory services to gain a better understanding of the risks that Mr J posed, it is possible that the homicide committed may have been preventable," stated the report findings. Following the publication of the report, Ms Welsh's daughter Joanne said she hoped lessons would be learnt from her mother's death. "It is extremely upsetting to hear the conclusion that my mother could still be alive today had it not been for misdiagnosis, failures in communication between the relevant agencies and a lack of mental health awareness," she said. "Unfortunately, these failings meant that a very dangerous and unwell man was let down and allowed to commit such a devastating crime. "I sincerely hope that all parties involved will take the recommendations made very seriously and make the necessary changes to prevent other innocent lives being lost." During a Cardiff Crown Court hearing into the killing, it emerged that Constantine who had paranoid schizophrenia had been fit and well until suffering a mental breakdown in 2008. He had changed his name from Kevin Astley to John Constantine after the character played by actor Keanu Reeves in the action-horror movie Constantine released in 2005. The court heard that Ms Welsh offered Constantine a place to stay at her home in Thornhill, Cardiff as he was homeless and had been sleeping rough in the grounds of nearby Castell Coch. Ultimately both patients were let down by that failure, with tragic consequences. But Constantine beat Ms Welsh around the face, strangled her and cut her wrist before going on the run. He fled and eventually handed himself in after staying in a bed and breakfast hotel 80 miles away in Newtown, Powys. Constantine, who had denied murder but admitted manslaughter by diminished responsibility, was remanded to a maximum security hospital indefinitely under the terms of the Mental Health Act. The judge Mr Justice Christopher Clarke said: "The hospital diagnoses about you were sadly wrong. Your killing was linked to your abnormality of mind. Cardiff and Vale University Health Board's director of nursing Ruth Walker said it fully accepted the findings and was addressing any remaining issues as a matter of urgency. "The three years that have passed since these tragic events took place in no way diminishes their enduring impact and we would like to emphasise our sincere apologies and condolences to the victim's family," she said. The health board said HIW recognised the unpredictable nature of mental health disorders and that it was not always possible to foresee every potential eventuality. Ms Walker added: "It is clear that communication between statutory agencies fell short of expectation and ultimately both patients were let down by that failure, with tragic consequences. We have worked to correct many of the deficiencies highlighted in the HIW report." In its response, South Wales Police said: "The Healthcare Inspectorate Wales report makes two recommendations for police to review policies and processes for the management of arrest warrants. "These reviews have already taken place and we are confident that our systems are robust to ensure individuals who are wanted on warrant are dealt with effectively." The force said it had also appointed four mental health liaison officers to "strengthen our links with partners". The Welsh government, which commissioned the HIW review, said it would be following up the recommendations made by the inspectorate. Dr Ruth Hussey, the chief medical officer for Wales, said: "My thoughts are very much with the families of those affected by this serious and deeply distressing case. "While risk can never be eliminated entirely, it is vital we do everything possible to identify any shortcomings in care and put in place measures to reduce the risk of such tragic incidents happening again."